Jun 22, 2011 Posted by AAfterwit on Jun 22, 2011 | Comments Off on About Those Teachers Who Want Us to “Think About the Kids?” They Cheat. About Those Teachers Who Want Us to “Think About the Kids?” They Cheat. A 55 year old lawyer turned principle turned “instructional superintendent” has resigned from the Washington DC school systems amidst claims that the school of which he once was principal cheated on standardized tests while he was at the school. (Wayne) Ryan, 55, who practiced law in Texas before becoming a principal, won a 2005 Distinguished Educational Leadership Award, sponsored by The Washington Post. But his career took off under )then-Chancellor Michelle A.) Rhee, who hailed him as a rock star when reading and math scores on standardized tests grew dramatically from 2006 to 2009. Reading proficiency rates spiked from 24 percent to 85 percent, while math proficiency surged from 10 percent to 63 percent. He became a poster image for D.C. school reform in the Rhee era. “Are you the next Wayne Ryan?” said a principal recruitment ad. But Noyes was also one of more than 100 D.C. public schools with classrooms flagged by authorities during that period for elevated rates of answer sheet erasures in which incorrect responses were changed to correct ones. A USA Today analysis of erasure data published in March found one seventh-grade classroom at Noyes with an average of nearly 13 wrong-to-right erasures per student. The District-wide average for seventh-graders that year was less than one. Ryan is not the only one. The FCAT is Florida’s most important school test and on Friday, three Central Florida schools are under investigation for cheating on it, according to officials. The state said they got suspicious because too many answers were being erased on the test. The state hired a security company to do a forensics analysis on the tests and that company raised concerns about 7,000 tests in 14 different counties around Florida, including Orange and Seminole County. After an investigation into FCAT cheating, the state has thrown out 90 tests in one Central Florida county. Seven thousand tests were thrown out statewide for having answers so similar that it is statistically unlikely it happened randomly. Ninety of those tests were tossed out in Brevard County. Fourteen school districts were ordered to investigate test results at 21 schools. While these investigations are still in their infancy, there appears to be something there in the way of cheating. How much are teachers involved? It is hard to say. Statistically, it would make sense that a few random students would be cheating on the tests. When those statistics start to “cluster” into a classroom, there is a problem that goes beyond just a random kid or two. When the clusters start to appear in entire schools, a whole different ball of wax has been thrown into the mix. Generally speaking, teachers hate standardized testing to measure proficiency and advancement of their students. Because of that, teachers have a tendency to “teach the test,” which is to say they teach what is going to be on the test, rather than the general knowledge that would allow the child not only to be educated more completely, but would also enable the child to pass the test. Teachers and teacher’s unions have always hated and resisted any indicator of how well their students are learning. Standardized tests are a barometer of that learning and teachers just don’t want their performance to be evaluated. There is a bit of hubris in that attitude. Educators believe that they and they alone should be the sole determiner of the progress of a child. They believe there should be no standards against which to judge that determination. Teachers have forgotten that standardized tests for measuring progress and school competency came into being because of their failure to hold students up to any sort of educational standards. For years, we saw kids graduating high school that couldn’t read. Kids that were entering into the marketplace did not have basic math skills. The schools and the teachers were failing so badly and without oversight because of our trust in them, that when the violation of that trust was exposed, the remedy was to start standardized testing. Teachers and teacher’s unions have fought testing at every turn. They have tried to sabotage the tests and the process surrounding them. Now they appear to have stooped to the level of cheating. The remedy is simple. Any teacher who is caught cheating or helping kids cheat on tests should be instantly and summarily fired. The same goes for principals and administrators. 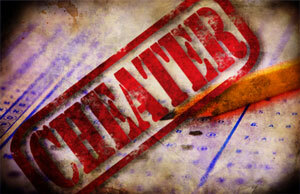 If you cheat, there will be a severe price to pay. That is a lesson we can all agree upon. I don’t have to look up my family tree, because I know that I’m the sap.